This datalogger module can be used to monitor humidity and temperature of greenhouses, warehouses, food transports, aircraft cabins, refrigerated trucks, containers, museums, and HVAC equipment. It measures and stores up to 16,350 relative humidity and 16,350 temperature readings over 0 to 100% RH and -40 to +70°C (-40 to +158°F) measurement ranges. The Temperature & Humidity Datalogger is designed with a high accuracy Temperature & Humidity Sensor. This datalogger is provided with features of high accuracy, fast response and stability. It is widely used for monitoring and collecting data of environment temperature and humidity. You can monitor temperature and humidity values efficiently and conveniently for long time periods by using the Datalogger. The readings are saved in the logger and simply read out by your PC with USB. 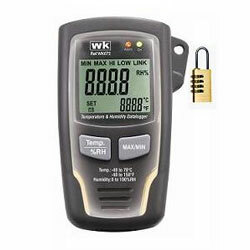 The LCD can show current readings, MAX, MIN, TIME, DATE and temperature or humidity values. At least 7 MB byte hard disk space available to install HT Datalogger USB software. Recommended display resolution 1024X768 with High Color(16 bit).